So, why the heck would you take the time to draw out your own plotting sheet rather than simply buy one? Well, when you're in the middle of nowhere, you would wind up with a lot of charts that would be completely blue with a few depths (several miles) scattered across the page. These charts would cost about $20 apiece and wouldn't give you much more information than a sheet of white paper with some lines on it, so you might as well use that sheet of white paper. So what can you do to avoid buying a bunch of blank charts? Make or buy plotting sheets. You can buy large scale blank plotting sheets for pre-determined latitudes and simply write in your longitudes, then when you move off the chart, erase your numbers and start all over again on the same piece of paper for new longitudes. But if you still don't have the money to buy these, (and you do have the money to pay your 2nd mate bundles of overtime) you can actually make your own plotting sheets in 10 minutes or less. How? I don't know... Well, alright, I do, and here goes. 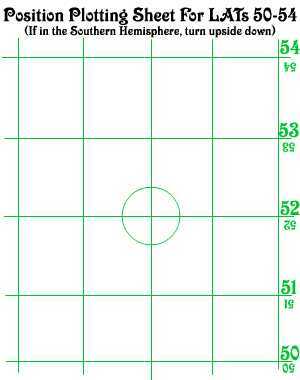 To utilize a Position Plotting Sheet, like the one above, that comes pre-printed with the latitudes and the correct spacing for the longitudes, all you have to do is simply write in the desired latitudes next to the pre-printed lines. The spacing is how it really is, and there should be a minutes scale somewhere along the latitude and longitude lines, so you don't even have to calculate the spread for 50 minutes, you just spread it.